Cool off at Hurricane Harbor Water Park, next to Six Flags Magic Mountain north of Los Angeles, California. A hot summer day is the perfect time to vacation escape the 90 - 100 degree temperatures, so take a day trip here or spend the night at a nearby hotel as you visit both Six Flags theme parks. The Six Flags theme parks are located about 60 miles north of Disneyland, 30 miles north of Universal Studios California, and 150 miles north of San Diego. The water park is open seasonally so be sure to check the calendar. Bonzai Pipeline - A looping water slide new for 2014 season. Bamboo Racer - A water toboggan challenge water ride. 42" minimum height. Black Snake Summit - 5 snake water slides for brave souls. 48" minimum height. Forgotten Sea Wave Pool - This is the Hurricane Harbor water park wave pool, to chill out in the gentle waves. Lightning Falls - Must be 48" or taller to go over the falls on this fun water slide ride. Lizard Lagoon - Relax in leisure in the lagoon. Lost Temple Rapids - Fun rafting ride at the Lost Temple of Hurricane Harbor water park. 42" minimum height requirement. 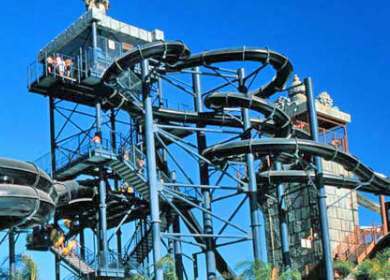 Reptile Ridge - Choose water slides with 70 foot straight drop or 230 foot turbo twister. Fun! Must be 48" or taller to ride. River Cruise - Every water park must have a lazy river ride, and this is it at Six Flags Hurricane Harbor water park. All ages. Splash Island - More water fun, fountains and slides to keep you wet and cool. Taboo Tower - High speed water slides for thrill seekers 48" tall or taller. Tiki Falls - High speed tube water ride. Fun for riders 48" tall or taller. - Thrilling water park ride through a 132 foot long water funnel, one of the best rides at the Six Flags water park. Must be 48" or taller to ride. Before you go to the Magic Mountain theme parks, check out some discounts and coupons. There are many other smaller attractions covered in the price, including Hollywood studio tours, Pacific Park at the Santa Monica Pier, and more. LA Theme park Package - The Go Card Los Angeles Theme Park package includes Six Flags Magic Mountain, Universal Studios Hollywood, Legoland California, and Knotts Berry Farm. A great choice if you want to hit the major LA theme parks except for Disneyland. Online coupon - Why not google it and see if you can find an online coupon? AAA member discounts - AAA members may save money on tickets and other special deals. Check with your local AAA site. Costco Discount tickets - We have not seen any Costco discount tickets to Six Flags Magic Mountain theme park or water park, but check as the offers vary. Where is Hurricane Harbor Water Park? - Six Flags Hurricane Harbor Water Park is located north of Los Angeles California, at the Magic Mountain Parkway exit off freeway 5 in Valencia Calif. The location is about 30 miles north of Hollywood and Universal Studios and 60 miles north of Disneyland. Directions to Six Flags Hurricane Harbor - From freeway 5 north of Los Angeles, exit at Magic Mountain Pkwy. and go west along Magic Mountain Parkway to the water park entrance.